Capacitors are found in most electronic devices. What they do in their most basic sense is to store up a specific charge of electricity and then release it. Their most common use on computer equipment is to smooth the power in a circuit to supply a device with the quality power it requires to operate correctly. They also provide hold up power when current is changing and the power delivery circuits cannot work fast enough to accommodate this change. There is no need to go into depth about the use of capacitiors in VRM design, it would take pages and be quite boring. The thing you need to know is that processors need to be supplied with quality power. This service is performed by a VRM or Voltage Regulator Module which could be considered an area of the motherboard near the CPU. It is not simply one piece of electronics, it is quite a few pieces working together. Whilst the computer power supplies supply lines of various types of voltage like 3.3v, 5v, 12v each processor requires a specific small voltage which is not supplied by those lines. So the VRM will take the DC power supplied by one of those lines and output the correct voltage that the processor requires. Older processors used the 3.3v or 5v line. Current ones use the 12v. 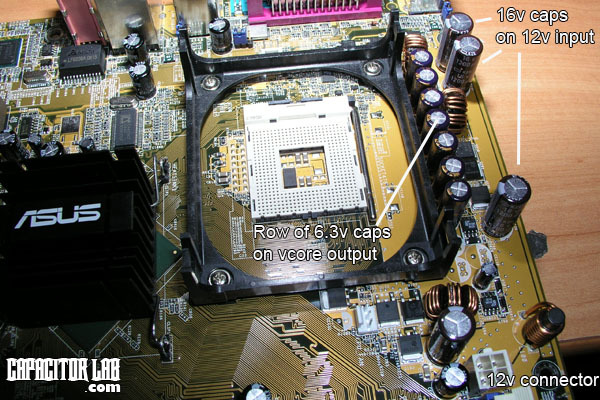 The above image of an Asus P4c800e motherboard gives a basic idea about the positioning of the capacitors for CPU power. The 12v connector is indicated that provides the 12v line from the PSU. Then there are 16v capacitors on the input of that 12v line before it is converted to the lower voltage required for the CPU. Then after it is converted there is a row of 6.3v capacitors which are connected in parallel and provide the smoothing of the vcore output. It is necessary to use capacitors that meet or exceed the voltage expected in a circuit otherwise they will be damaged. So for the 12v input 16v capacitors are used because they are the closest value available that exceeds the 12v expected on the input. This is one of the reasons why you must never use anything less than 16v capacitors on the 12v input, they will not last very long if you do. Similarily 6.3v capacitors are used on the above board for the vcore output. Of course the vcore output will be less than 2v and will depend on the processor used. Unfortunately in electrolytic capacitors 6.3v is the smallest value available so that is what is used. Polymer capacitors which are more common now on vcore output are available in 2.5v or 4v values so they are used instead on some boards. Now we will look briefly at the specific reasons why capacitors are used in VRM circuits to get a basic idea. The DC-DC conversion of the power supplied to the processor from the PSU to the small voltage required by the processor is performed by switching circuits. Due to the switching nature of this regulation the power is in periodic pulses. In order to correct the voltage ripple and spikes, capacitors are used in the VRM circuit on the output. But that is not the only thing they do. A CPU will require different amounts of current depending on its present mode of operation. It can quickly jump from requiring a negligible amount to requiring maximum current. Unfortunately for the VRM circuits supplying that power, the CPU will be changing its mode of operation all the time. The change in current draw will be in a duration of milliseconds and the CPU must be provided with a constant supply of voltage during that period and indeed all the time otherwise it will begin to make errors and the computer will crash. The output capacitors in the VRM are there also to supply constant voltage to the CPU during these Load Transients. Capacitors are not the only thing in the VRM that corrects the power distribution to the CPU however. We will discuss in a further article the other components.